Any road warrior worth his or her salt has a favorite way to carry their gear into battle. Mine arrived in my consciousness many years ago when the company provided a Dell laptop case along with the corporate laptop. The accessory case has out lasted both the case and the laptop. The contents? A wireless mouse, small surge protector, 2 RJ 45 reels, HP power supply, Bluetooth dongle, several USB cables, and several USB thumb drives. It fits into my current backpack and allows me to keep track of all those things you take along so you can actually use your laptop. Well, the old accessory bag may have met its match with the Skooba Cable Stable DLX ($39.95 USD). First, as you can see in the above photo, it has plenty of room for the gear and you can actually see it for a change without digging and wondering if you actually left important dongle at home. True to the description on the package, the zippered case has a place for everything with a variety of pockets, elastic, and sleeves. The mesh pockets are great for wireless mice and RJ 45 reels. 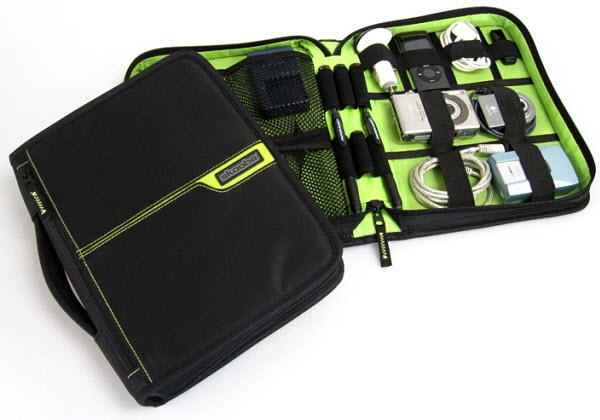 The zippered mesh pocket holds I really like the place for small USB thumb drives, batteries and pens in the spine. 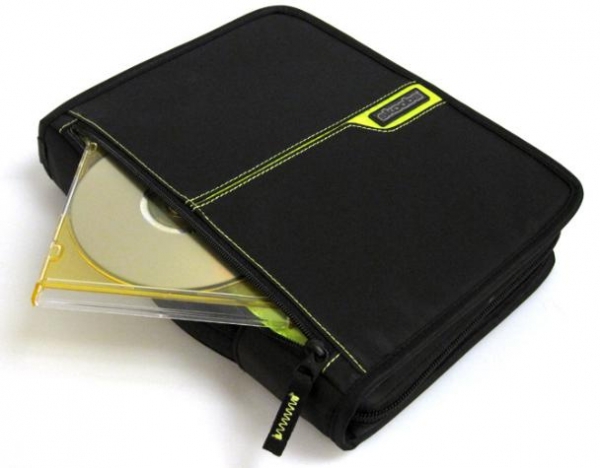 There is also a zippered pocket on the front for those of us that carry CDs or DVDs along for the ride (see above). The great part is that it is about the size of a hardback novel and easy to fit in almost any PC bag. Skooba Design makes a variety of computer bags, protective sleeves, and accessory carriers. Next time you are looking to replace that old, faithful carry-on take a look at what they have to offer. I know I will. Jeff Deneen is the Principal at 17 STS Marketing Group, a company which is focused on customers, prospects, and using technology to enable companies to communicate with them. You can catch his blog at 17sts.wordpress.com. He recently moved to Birmingham, Alabama along with his wife, daughter, son, dog, and two cats. His wife accuses him of having a Bluetooth headset permanently implanted in his right ear.